I picked up two Besame lipsticks a couple of weeks ago from a discounter on eBay and managed to get both for around £12. 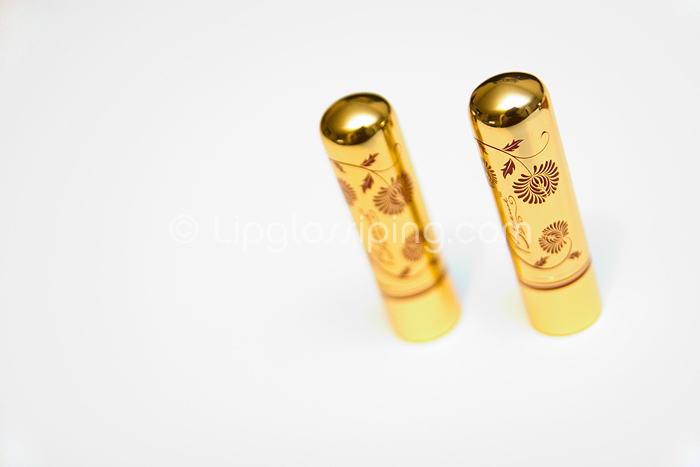 They’re the older style lipsticks with the retro shaped tips that help you get a beautifully sharp line. I believe they’ve since reformulated. 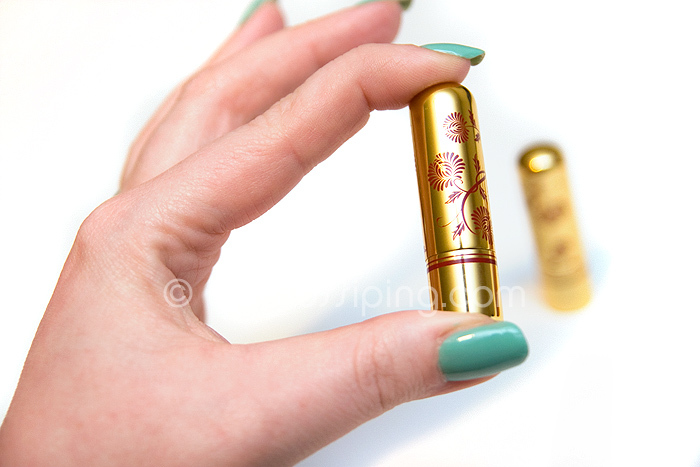 These little lippies are teeny tiny… 1.8g compared to a 3g MAC lipstick and the casing is about 2/3of the height. But look how beautiful they are! I picked up two pinks. Exotic Pink (a bright true hot pink) and Portrait Pink (a subdued ‘nuder’ pink). 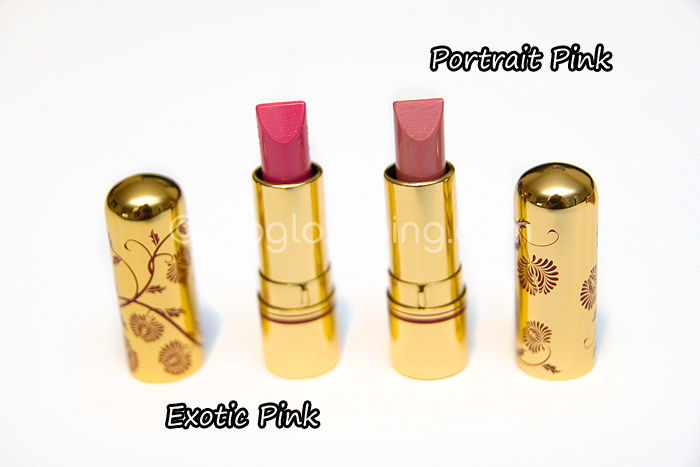 Exotic Pink is densely pigmented and absolutely rich with colour. 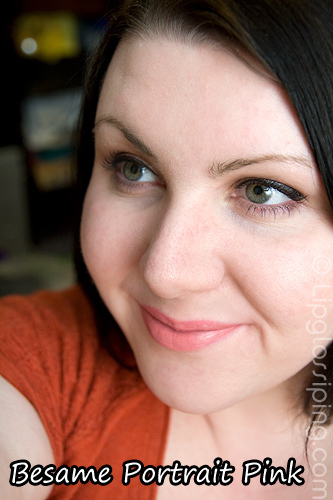 You can see from my swatch… it’s very opaque and glides on beautifully. Portrait Pink is sheerer, but still builds to an opaque glossy finish with a bit of work. I adore both of these lipsticks and I’m really happy to add them to my collection. They’re not the most moisturising lipsticks I’ve worn, but staying power is great and both shades are completely adorable. Are you a Besame fan? i LOVE the packaging! and the exotic pink looks gorgeous on you. The packaging is SO pretty :3 and Exotic Pink is gorgeous on you. Loving the vintage look of these lipsticks. As if the box was not pretty enough, there comes a precious golden little treasure when out of the box. Both colours suit you nicely. They’ll be again such a nice original present to a mum (not implying that it’s for an older clientele) as they look very unique and precious. Small size is actually a bonus and would be something you would be proud to take out of your handbag and would just become naturally the focus of conversation. 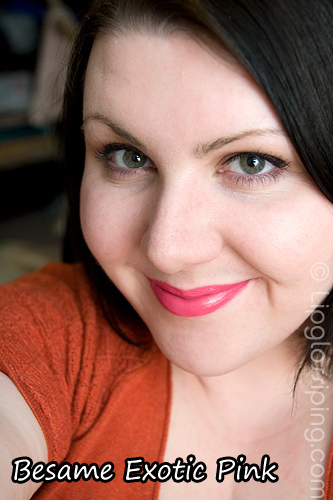 Very pleased on how the exotic pink looks on you: looks much pinker on your lips than on the swatch. ps) I love how the pixies are updating the site in your absence, MAGIC! I just visited their website, the lipsticks are a little expensive for me, but I love the look, I may try them. Exotice Pink is gorgeous on you, really like that. And such lovely packagaing. Love them. Okay, so I’m totally adoring Exotic Pink on you. And those tubes. Those tubes! Ever since getting my first (and only) Besamé product (a tube of gloss,) I’ve been craving more — the detail and design of the packaging is just exquisite. We discovered these about 5 months ago and sell them on Cult Beauty where they are one of our top-sellers (especially, funnily enough from men buying them as gifts for their girlfriends/wives!!). 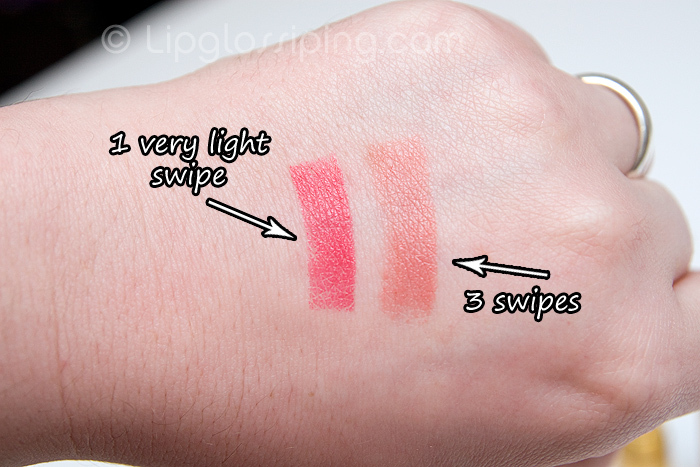 My first impression on reading about them was that the lippy might be a bit gimmicky, but it is seriously pigmented. It does cost a little more per gram than some lipsticks, this is because it is a small artisan company without the economies of scale of say MAC; but hopefully worth it in order to be a little different. I’m not much of a lipstick fan (to wear on myself) but these are making me change my mind.. dinky and sweet enough to carry around easily, beautifully designed and well priced for the quality + look of it, I am sold! Exotic pink looks *sensational* on you!! Yay~ I was hoping someone would review these. This store http://www.candyviolet.com/ started selling besame a few months ago. The colors and packaging looks really pretty, but I was wondering how the quality was. They are on the expensive side, but not terribly expensive. I’d really like to try Noir red or merlot. the colors are both gorgeous and the actual lipstick is so pretty! The packaging is so pretty! And I love Exotic Pink, it’s a beautiful color and looks great on you! I absolutely love the packaging, it’s so beautiful. But they’re so so teeny! I really like exotic pink. 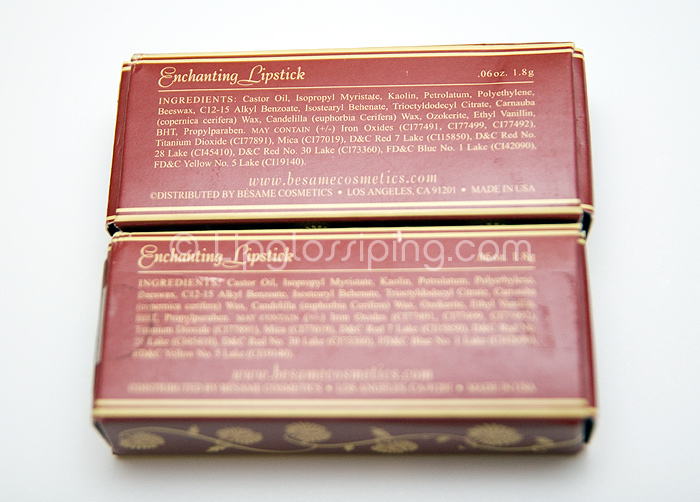 I’d love to have some Besame just because of the amazing packaging but the price and size puts me off. You’d want whip them out for a touch up about a hundred times a day with packaging that pretty and classy! I’ve heard these are the right size for my vintage lipstick holder- so now I’m sad the packaging is so pretty I might not want to put them in my holder! 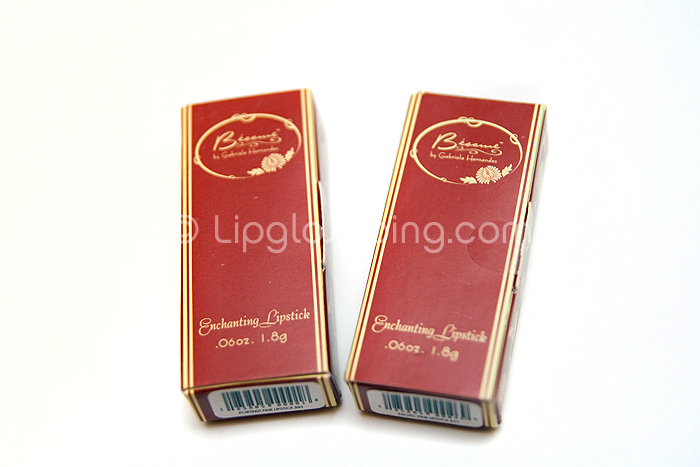 You are a beautiful lady to begin with; the lipsticks are both great on you! and they’re so cuuute!